Rowan wakes you up the next morning (and interrupts your dream about a strange wizard) to tell you that a weird guy has arrived on the island. Head to the south-west exit of your farm to bump into Sam the merchant. He tries to sell you a few bogus wares, but you aren't convinced. Sam used to live in Beacon town, but now he lives on a neighboring island. He just happen to see the light from the lighthouse and came to check it out. He'd like to move back, but his shop was wrecked in that big storm. You volunteer to fix Sam's shop, but you'll need an Axe. Sam suggests you go talk to Jeanne, who then suggests you go hunt down Naomi. Her blue-roofed house is in the southeast corner of Beacon Town (basically, back where Sam is). Nobody is home at Naomi's house, but you soon meet her daughter, Sally. The teenage girl doesn't like strangers around her house and tells you to buzz off. Walk back to Jeanne and tell her about grouchy Sally. Jeanne suggests you give Sally some Bamboo Shoots, which you can find on the ground around Jeanne's house. Give Sally a Bamboo Shoot by opening your bag, moving to the Crops inventory, selecting the Bamboo Shoot, picking "Hold," and then talking to her while holding the Bamboo Shoot. She'll warm up to you - a little bit. She's not convinced you're telling the truth and wants you to bring her a crop you've grown on your farm to prove your authenticity. Your Cabbages will ripen tomorrow, so go back to your farm and pull weeds all day or just head to bed. In the morning, Rowan will explain how to harvest crops. Take your new Cabbage to Sally by going inside her house to Hold and show it to her like before. You'll also meet mom Naomi, who is impressed at the sight of your massive Cabbage. In exchange for your leafy gift, Naomi gives you their Axe. You can now use the Axe to cut down Softwood Trees; the triangle-shaped evergreen trees on your farm. Just walk up to a tree and press your action button (A for controllers) to chop down trees. The game will automatically utilize the Axe from your tool inventory without you having to manually equip it. You'll eventually get an Axe upgrade to chop down the flowery Hardwood Trees. Once you have at least 5 Softwood Lumber (you already have 100 G), go back to Sam's house and press your action button on his house to fix it up for him. 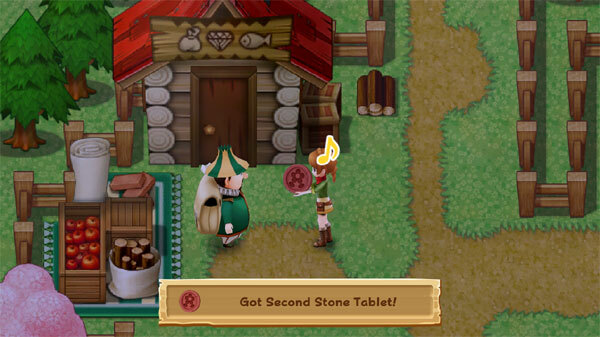 Sam will be so happy that he'll give you another stone tablet that he found as thanks for your hard work. 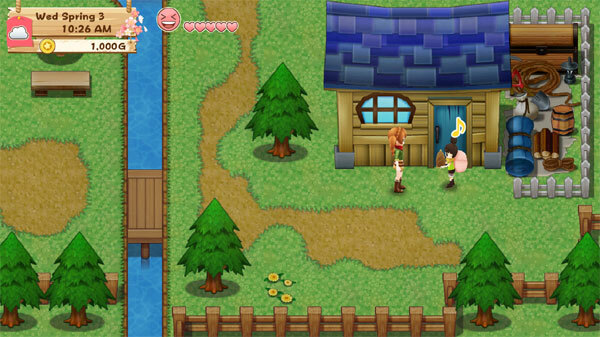 Jeanne wonders if maybe fixing up the other houses will bring the other villagers back too. Take the tablet back to the lighthouse and place it on the mosaic panel. Nothing happens with the lighthouse though! Rowan things it might need more energy from the people who come back to the island. He wants you to fix up the other houses to entice the villagers to move back. The easiest house to repair is Carol's flower shop. It is just to the south of Sam's hut and requires 7 Softwood Lumber and 200 G. After it's completed, spend the day chopping down more trees or simply go to bed. 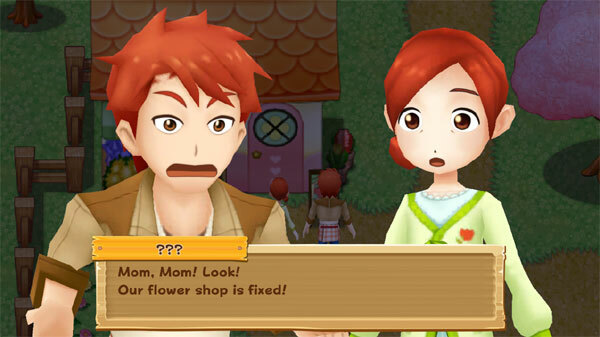 The next day, go back to the fixed flower shop and you'll meet Dean and mom Carol, who are both thankful for their house being repaired. They give you 5 Marguerite Seeds and 5 Fertilizer. After they leave, another little Harvest Sprite appears, this time it is Blossom, the sprite of flowers. Rowan thinks the two of them together might revive that second tablet, so head back to the lighthouse to give it a try. The two sprites will work together and use their power to add another lit window to the lighthouse. NOTE that the in-game day will be over once Rowan and Blossom activate the second tablet. You will automatically go to bed after the window illuminates.